I’m a sucker for a good anthology. I particularly enjoy ones with strong framing sequences, and a solid theme running throughout. 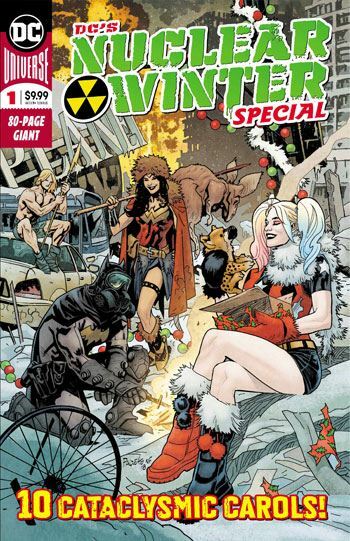 So there is nothing I can do but heap praise onto the DC’s Nuclear Winter Special. Usually this would be devoted to Christmas stories, and, indeed, Christmas does play a part in many of the tales collected here. But that is really secondary. The more compelling link between the tales is the post-apocalyptic setting they are given. Rip Hunter is given the framing sequence, spinning the tales we read as he tries to divert and delay a ravenous horde out to attack him, hoping to get his time sphere charged up so that he can escape. Setting the stories in the future allows for some variation in the heroes who get portrayed here. By which I mean, you can always count on Superman and Batman getting tales in these kind of anthologies, but in this instance we get to read about the adult Damien Wayne as Batman, and the Superman from the 853rd century (Superman One Million), who has not been seen in quite a while. Honestly, I don’t think there was a single story in this issue that I didn’t like, although obviously I preferred some to others. The Flash has probably the most normal tale in the issue, and the Catwoman story felt fairly run of the mill. I was far more engaged with the aging Aquaman and Green Arrow in their outings, both highly effective and evocative of the cranky old men. I found the Supergirl story quite interesting. It reminded me a bit of the end of the Peter David’s run on Supergirl, with her bonding with a young, orphaned girl. I also loved the Firestorm tale, which brought back the Nuclear Family, and did more with those robots than any other author has. I’m a big Kamandi fan, so of course I have to place the Kamandi story at the top of my list. It’s not very far out for a Kamandi tale, but we see that character so rarely that any adventure is welcome. And he gets to pal around with bears in the snowy wilderness. A very enjoyable collection of unusual stories, all bound together by a hapless Rip Hunter. Fun for one and all.